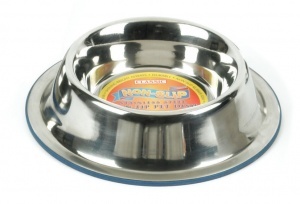 Premium stainless steel food and water bowl for large dogs. Key features include an anti-slip rubber ring at the base of the bowls and non-tip design. The bowls are rust and chew proof, dishwasher safe and chip and peel resistant. 27cm diameter for large dogs.